The Department of Enterprise, Trade and Investment Northern Ireland have released proposed changes to the Northern Ireland Renewables Obligation (NIRO) as part of the small scale banding review consultation. The consultation is part of an ongoing process that sees banding reviewed to ensure that support levels for various technologies meet their aims (supporting uptake of renewable technologies), while remaining cost effective. The current proposed changes would take effect from April 1st 2015. The Consultation will close for responses on 25 September 2014 and if you have an interest in small scale (particularly domestic) solar PV in Northern Ireland, you might want to have your say. The proposed new banding levels see onshore wind, anaerobic digestion and hydro left untouched but see major cuts in solar PV support. 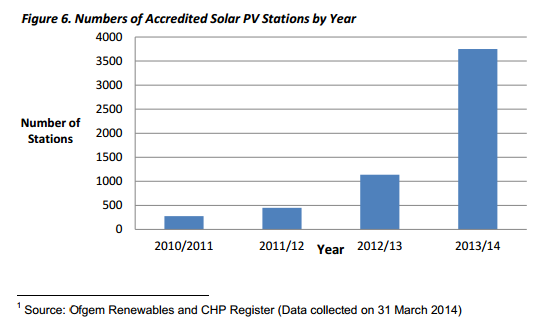 Solar PV adoption in Northern Ireland has been quite the success story in recent years. The consultation document looks at data from the Ofgem Renewables and CHP Register. The period from 2010 to 2013 / 2014 has seen growth from 227 small scale generating stations to 3,750 and from a total installed capacity of just over 1MW to over 20MW. You can see from the graph below that the most significant and fastest period of growth has been the most recent 12 months. This growth reflects significant decreases in capital costs for solar PV. Capital costs for solar PV are estimated to have fallen by between 69% and 75% depending on the size band in question. This drop has made solar PV an increasingly good investment across the 4 years in question and presumably been a strong driver of uptake. Based on the evidence from the banding review, DETI has formed the opinion that the 4 ROCs / MWh currently given for solar PV up to 50kW is “overcompensation”. This will have many in the industry scratching their heads in exasperation. There is a hint of “the subsidy is successful therefore the subsidy must be too big” in the thinking here. Costs have fallen and it is logical that the support should come down to some extent to reflect that. The consultation document points out that solar Feed in Tariff rates in GB have fallen from 43.3p/kWh in 2010 to 11.73p/kWh. The Feed in Tariff rate now has a built in quarterly degression mechanism that sees tariffs reduced in each band if adoption levels are on target. For some reason DETI chose to quote 11.73 p/kWh as the current solar FIT rate. This is the middle rate tariff for installations in the 4kW to 10kW capacity range. The middle rate is a discounted multi-installation tariff that applies when you already own 25 or more installations. The much more commonly quoted headline FIT rate is the higher rate tariff for up to 4kW and is currently 14.38 p/kWh. This is the rate that applies to almost all domestic installs, providing the EPC requirement is met. Could a Drop to 1.6 ROCs Kill Domestic Solar in Northern Ireland? At present a 4kW domestic solar panel installation in Great Britain will receive support through FIT at a rate of 14.38 p/kWh. These rates are index linked and guaranteed for 20 years. At present in Northern Ireland, the same 4kW solar panel installation will receive support through NIRO at a rate of 4 ROCs per MWh. Power NI’s Generation Tariff offers a fixed price for ROCs for generators up to 50kW. This price is currently 4.24 p/kWh for 1 ROC. Solar has 4 ROCs, giving a value of 16.96 p/kWh. On the face of it, that looks like a reduction to 1.6 ROCs would bring support in Northern Ireland down to 6.78p/kWh. That just seems bizarre in comparison to a GB rate of 14.38p/kWh. Especially when you consider that FIT payments are guaranteed for 20 years and index linked and that much of Great Britain also gets more sunlight. The Review of RO Banding For Small-Scale Renewables, a report carried out for DETI by SEPA quotes the return for domestic solar at the current 4 ROCs as 15%(real). You’d have to agree that this seems excessive. Their analysis suggests that a reduction to 1.6 ROCs for solar PV would still see expected returns of 9% (real). … so while there might in reality be some slight reduction in deployment on more marginal sites as a result, the change does not make the technology uneconomic as a whole. In March 2012 the Feed in Tariff in Great Britain was reduced from 43.3p/kWh to 21p/kWh. The result was a huge rush to adopt PV in advance of the tariff reduction, a huge fall off in uptake post the change and a lingering, although false, perception that the returns are no longer worth the investment. Since then, and specifically to avoid another large scale and damaging shock to the market, the FIT scheme has moved to a sensible system of quarterly reviews and small, quarterly cuts in tariff rates based on adoption levels being met (and they frequently fail to be met). I suppose the point is that even if you accept that solar PV is “overcompensated” at 4 ROCs, a reduction of the scale of bringing it down to 1.6 ROCs is going to be a huge shock to the market and will disrupt solar PV uptake. The notion that there will be “some slight reduction in deployment on marginal sites” seems wildly optimistic. Much more likely is a huge peak in domestic and small scale commercial adoption in the lead up to the change, followed by a near total collapse. Best case scenario here looks like solar PV adoption in Northern Ireland goes back to the rather poor looking levels of 2010 / 2011 (see the graph above). It just seems hard to see how a subsidy level of 6.78p/kWh can be expected to drive growth in Northern Ireland, when FIT in Great Britain is at 14.38p/kWh to do the same job. This entry was posted in Feed in Tariffs, Grants / Funding, Green Business, Solar. Bookmark the permalink. ← Solar FIT – What do Higher, Middle and Lower Rates Mean?